The Parking Puck is an interesting non-slip device helps prevent motorcycle tip-overs. What do you call these things? In the old days, we’d use a flattened soda can to place under the motorcycle’s side stand. Who knows how today’s cans would work — the aluminum they use is so thin you can read the latest edition of Cycle News through them. Both sides. Of the can, that is. I guess the Parking Puck can be called a “Side Stand Surface Area Enhancement Device” or maybe a “Side Stand Foot”? The idea is to carry one around and slide it under the side stand when parking on the grass, soft dirt or hot asphalt. I’ve seen more bikes tip over on sun-baked Florida asphalt than anywhere else. The Parking Puck increases the surface area under the normally tiny side stand plate and hopefully prevents the side stand from sinking in, resulting in a tip-over. It weighs 10 grams, or 3.25 oz. and it’s made from an official NHL hockey puck, made in Canada. 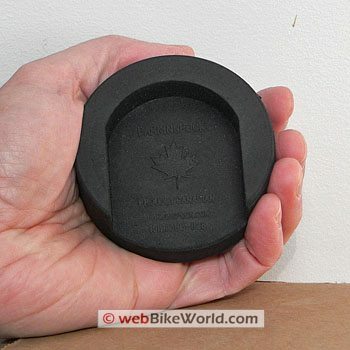 I’m not sure that it matters whether it’s an official NHL hockey puck or not; I have seen some motorcyclists use pucks as side stand plates, but a regulation puck is 1″ thick and that usually will put the bike too upright for safe parking. The motorcycle needs some weight on the side stand or you may risk tipping over the other way. It’s happened. To me. The Parking Puck has a large cutout, bringing the business surface down to 1/2″ above sea level. This gives plenty of room for most side stands with normal sized feet. It can be slightly tricky to maneuver the Parking Puck in to position with your toe as you’re holding the bike. But the alternative is watching the bike sink into the ground (slowly, you hope) while you search around for a piece of wood, soda can (or two) or milk carton. A hockey puck is 2-15/16″ in diameter (2.9375″), so that gives, uh — let’s see: the surface area of a circle is pi times the square of the radius, if I recall (actually, I didn’t recall this but had to look it up!). So 3.14159265 * [(2.9375/2)squared] = 6.77″? Whew! So the Parking Puck gives maybe 4 or 5 times as much surface area as the foot on a normal side stand. I’m sure the engineers out there can probably calculate the pressure per square inch, depending upon the lean and weight of the bike. I’m not sure how the Parking Puck is made; I’d like to think it is machined but I don’t see any tooling marks on it (Update: See note in comments section below). It fits in a pocket and I suppose you could drill a hole through it for a lanyard and secure it to the bike if desired. It does get kind of dirty, especially if things are muddy, and I suppose you could also carry a plastic sandwich bag to store it in before slipping it into your pocket. It’s easier to place the bike on the Parking Puck than it is to grab the puck when you’re ready to roll. If the ground is soft enough, you have to lean the bike back, kick the puck nearby and carefully bend over whilst holding the bike upright to grab the puck. This is where a flattened soda can comes in handy because you can simply leave it where it is for the next guy and ride off. (Editor’s Note: not really, MD’s just trying to be funny – make sure you reuse, recycle and clean up your mess!). The Parking Puck isn’t cheap at $8.00 CDN plus $10.00 US shipping. A discount is offered for quantities, and they can also be custom ordered with a logo or club name. 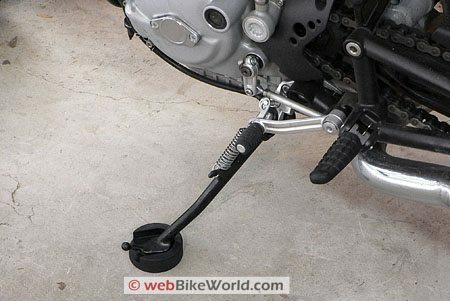 This may sound expensive, but believe it or not, Wunderlich, the BMW accessory manufacturer, makes a side stand plate for something like 50 bucks. Now that’s ridiculous! 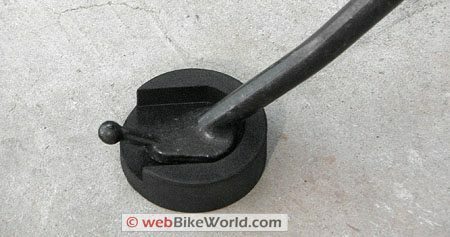 In fact, the first time I saw a puck used this way, it was on a BMW R1150GS, and the owner had drilled a few holes in the base plate of his side stand and screwed the puck directly and permanently to the stand. Worked really well for him. BMWs tend to lean really far on their stock side stands, often looking like they’re ready to topple over if they are heavily loaded. We normally use octagonal electrical junction box covers, with a string attached, as side stand plates. We place the string on the clutch lever as a reminder, and an aid to picking it up. These work nicely, fitting in a tank bag in the map window, since they take up so little room. In fact we often carry along extras and give them away to anyone who needs one. From the Parking Puck Manufacturer:: I read the review on webBikeWorld and would like to clarify a few things about the Parking Puck. You have listed the Suggested Retail Price: $8.00 CDN + $10.00 US S/H. But in actual fact, the PayPal services only work with one currency, so orders for each Parking Puck is $8.00 CDN but shipping varies depending on the number of pucks. For example, shipping for 1-5 pucks is only $8.00 CDN and shipping for 6-10 pucks is $15.00 CDN, and so on. Orders of >50 pucks have free shipping. When an order is placed online through the website, the amount is billed in Canadian dollars (a bargain for US buyers). The website information will be updated shortly to more accurately reflect the costs. The Parking Puck is not a machined item. It is manufactured using the same vulcanizing process as a regular puck which prevents tearing of the rubber and creates cleaner edges etc. The Parking Puck is versatile enough to accommodate different types of kickstands. The normal use of the Parking Puck would have the closed edge of the puck facing the other way which would aid in stopping the kickstand from sliding off of the puck. From “D.”: “If you’d really like to save a few bucks, you can pick up a few (2 ~ 3) THICK paper beer bottle coasters from your favorite tavern and glue them together with Elmer’s glue overnight. Voila! There’s your homemade ‘parking puck’. From “D.W.”: “I just read your review of the Parking Puck and thought I’d clue you in to Motrax’s MudBud (Side Stand Support).